Quick sketch drawn sitting on a chair outside the “Garden Gate” pub. I was on the way back from a New Year’s Day swim at the Ladies’ Pond. An old man said, “There a number 46 coming, if that’s any good to you,” and he rushed for it. I just had time to notice it said “St Bartholomew’s Hospital”. But it went past, and the old man came back, muttering that it hadn’t stopped. We all got on the next bus, which was a 24 to Pimlico. 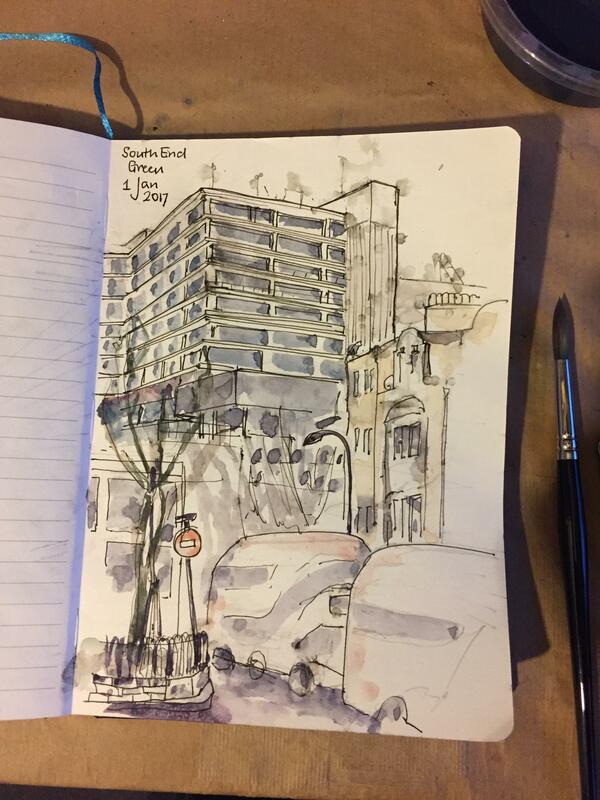 We went past other buildings worthy of drawing, including St Dominic’s Priory, Southampton Road. I got off at Warren Street, and walked in the pouring rain to Euston Square for the Circle Line. In the picture is the Royal Free Hospital, NHS Trust. Construction: 1968 – 1974. Architect: Llewllyn-Davies, Weeks, Forestier-Walker and Bar. On the right are two Heatherwick buses. About half an hour to sketch, coloured at home.